Excellent external Cb speaker for any Radio. Works very well with 10 meter radios and Cb radios to help reduce feedback when talk-back is used. 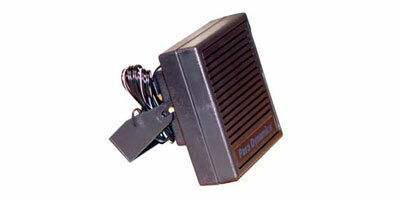 Great external speaker for radio scanners and other radio receivers. The Aries brand is discontinued. This items is available under different brand names. Similar speakers have been marketed under Uniden ESP-25, Pronouncer and Aries ASP25. Currently we are stocking the ParaDynamics brand. *Recomended for Galaxy, Magnum, Connex, NorthStar, Ranger, Cobra, Uniden & other radios with "talk back". *This one will have less feedback than most speakers when used with talk back. Recomended for Galaxys & other radios with "talk back". This one will have less feedback than most speakers when used with talk back. No rattel at high volume. 10' cord. bracket & hardware included, 10 to 15 watts, 4 7/8"w x 5"h x 3"d.